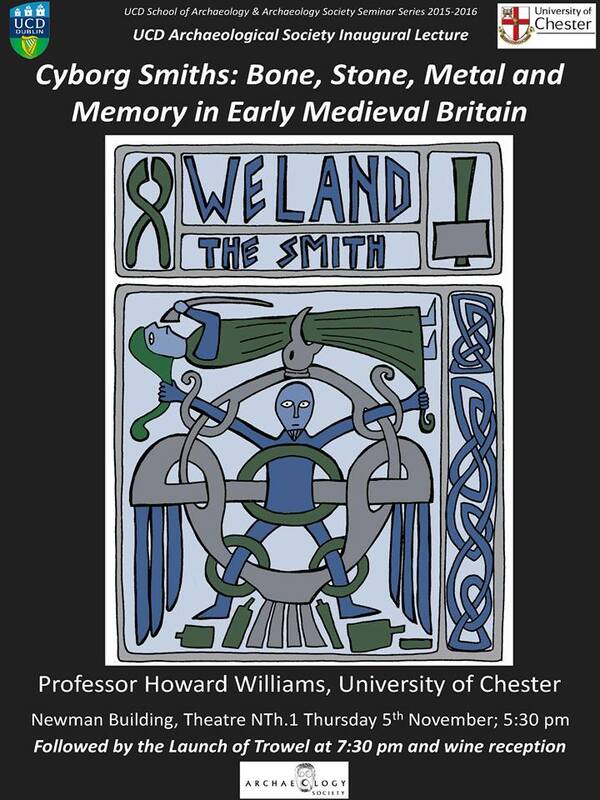 "Cyborg Smiths: Bone, Stone, Metal and Memory in Early Medieval Britain"
The Archaeology Society was delighted to receive Professor Howard Williams of the University of Chester to present the topic of smithing in early medieval Britain for the annual Inaugural Seminar, which took place on Thursday, the 5th November 2015. Professor Williams' work focusing on death, memory and materiality in early medieval Europe has made a significant and influential impact in his field. The material for his lecture on the night was sourced from his own current and ongoing research into the concept of the early medieval smith and the character's associations with places by means of connecting facts with stories. In his talk he discussed the dynamic interplay between the elements of the smithing process and how it could be construed as an elite way of life. Within his research he has singled out four key areas of focus - word smiths and artisans; carving smiths; bone, stone and landscape; and holy smiths. In the first area he discussed the subject of the mythical smith Weland and his supposed depiction on the Volund Stones and also on Frank's casket, in which he seems an anti-hero, depicted as a man of power and violence through the act of smithing. The second area of study Professor Williams presented to the audience is the idea of how Weland is again depicted on carvings as a cyborg figure, a manipulator of bodies and materials to suit his purposes. The next are of focus was on the connections between bone, stone and the landscape - the archaeology of smithing within the landscape, with emphasis on the monument known as Weland's Smithy located on the Lancashire Ridgeway, moving away from the archaeologies of metalworking and elite metal objects. He also discussed the corporeality of skeletal remains fond at Weland's smithy - could they be the remains of Weland himself, or they were the bones of his victims or they were even Weland's treasure constructed himself. 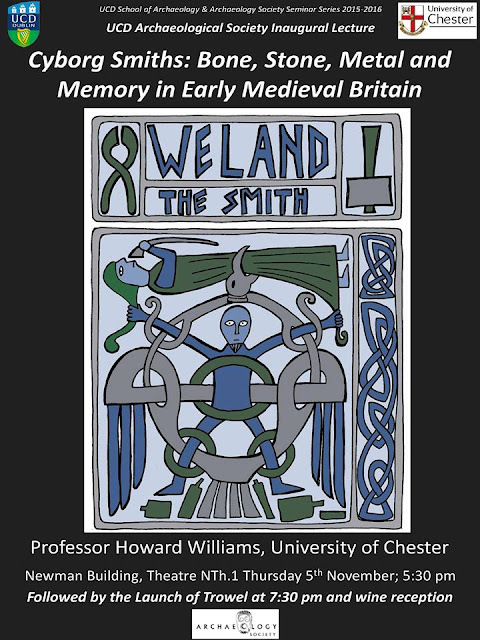 The setting in which Weland's smithy is to be found is indicative of ceremonial activities that took place there. The final area of discussion for the lecture was on the topic of holy smithing sites and how they were infused into a Christian monastic landscape. The lecture was concluded with the question of the role the smith played in the imagination and the mythical landscape and the nature of the role and power of the smith among elite society. Overall the society's inaugural lecture for 2015/2016 was a great success and was thoroughly enjoyed by everyone who attended on the night. Best wishes to Professor Williams and no doubt the school will welcome him back before too long.